You are free to choose to be treated by the Doctor of your choice. If your Doctor is unable to continue your care following admission, you are free to choose another Doctor. Alternatively, we’re happy to arrange for an Italian Doctor from the Lalor Clinic to take over your care. 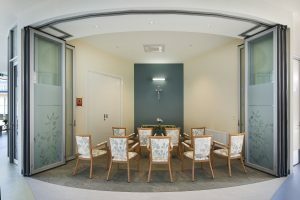 The Lalor Clinic Doctors have worked with us at San Carlo for many years and therefore have extensive experience in aged care. The Clinical Coordinator will confer with families so they may access a dental technician or dentist outside or within our facility when required. Unfortunately some of these services may not visit regularly and therefore relatives may need to accompany their loved one to the dentist or dental technician. San Carlo provides physiotherapy and massage at no additional cost. Other allied health services including podiatry, speech therapy and external continence management will be provided at no cost to residents with higher level of care assessments; however charges may apply to those with lower level of care assessments. External appointment to the audiologist can be organised with our assistance. Families are free to request external Allied Health providers of their choice to visit. (Please consult with our Clinical Coordinator and with the resident’s General Practitioner). Specialist assessments, equipment or supplies that are complimentary to services already provided by San Carlo Homes e.g. : private specialists or special wound care products may incur a cost. Those interested in Alternative Therapies should discuss this with the Clinical Coordinator and the resident’s doctor. After consultation, we may assist you in procurement of these services. Visiting hairdressers are available to residents and services are paid for individually. In the Hostel we have a Kiosk to allow our residents some retail therapy. Small personal items and toiletries may be purchased from our kiosk. Opening times on Tuesdays and Thursdays, times are as advertised. The Next of Kin/family may privately purchase for the resident sturdy labels and sew these on the garments prior to them being brought into San Carlo. Any clothing brought into San Carlo after the resident’s admission must also be labelled in this way. San Carlo will supply and label all items of clothing. The cost of these labels is approx. $100 for 200 labels for all new residents and $25 for 50 labels thereafter. Our staff will label clothing for our residents as they are admitted to the Unit. We ask that clothing be handed to the Nurse so she/he may arrange the labelling to be done. Respite residents can either arrange for families to collect laundry to be taken home and washed (at least weekly) or if they are wanting to have their clothing laundered at San Carlo all clothing must be labelled prior to admission or we can supply and label all clothing. If we are labelling the clothing the cost is $50 for 100 labels or $25 for 50 labels. As experience has proved that laundry markers do not endure our industrial washing machines (the Ozone we use in the laundry wash removes the ink) we ask that laundry markers are not used to label resident clothing. If a meal is required by a family member please give us notice of your requirements prior to 10.30 am on the morning the meal is required. There will be a charge of $6.00 for the meal. Newspapers and / or magazines delivery service may be organised through our Lifestyle Therapists. The paper will be billed to the resident’s account. Father Vito holds Mass twice a week and Rosary is conducted daily by our Nuns from the Missionary Sisters of St Anthony of Claret (Claretiane Sisters) who live on the premises. Residents are free to choose whether or not to attend. 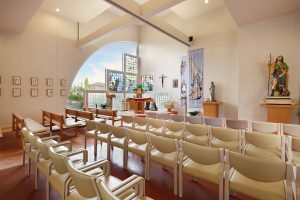 Residents who are not Catholic are encouraged to inform us how we can best meet their individual needs and preferences. Installation of private telephones must be arranged by the resident/family through San Carlo and we will bill the resident/family directly. There is set connection fee of $120 and a monthly fee of $35 irrespective of usage. Residents/Families will need to provide the actual phone. We ask that private phone calls are not conducted through San Carlo’s business line as it prevents its necessary use. In extreme cases it inhibits the communication of an emergency.